The history of modern China is a vast, complicated bit of business and one better suited for a website more geopolitically savvy than this here Comics Bulletin. I bring little to the table when I talk about China except mere platitudes based on my limited global sensibility carved from the trough of the American educational system and my over-reliance on Twitter as the source for my news. I know, in theory, that the establishment of the People’s Republic of China in 1949, and its subsequent “Great Leap Forward” and Cultural Revolution, set the stage for what is now the China we know as an economic powerhouse, home of 1,344,130,000 people, the world’s largest producers of plastic gewgaws, and the place where your I-Phones are made by folks working in slave-like conditions (or not – you would think we would get the definitive answer to this at some point). But I’m not here to talk about China specifically. Rather, as this is Comics Bulletin, the focus of this review is on a comic book, A Chinese Life. 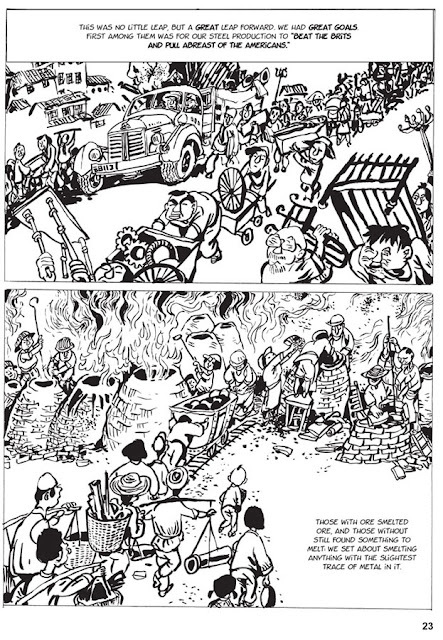 A Chinese Life is a graphic novel and a memoir, one which covers the transformation of modern China. It follows the life and development of artist Li Kunwu through nearly sixty years of upheaval and change as his country goes from the leadership of Mao Zedong to the modern economic policies of Deng Xioping. Through Li Kunwu’s life, China has gone from a time of deep commitment to ideology, a cult of personality, and a strong sense of nationalism and xenophobia, to a loosening of the constraints of collectivism, a rising middle class, and a focus on the fruits of individual endeavor. Yes, this book is a memoir. Yes, it is one man’s life. But A Chinese Life is an enormous story – as big as China itself, and I’m not just referring to its 704 page size. It is huge in terms of its intent and scope. Through one man’s story we see a culture go through dramatic social changes, its development following the same trajectory of maturation as Li Kunwu’s: from an infant revolution learning to walk and talk, to a petulant teenager obsessed with appearances, to finally adulthood with a greater understanding of social order and its place in the global community. A Chinese Life shows the development of a country as much as it does a man. And it is within this collision that so much of the power of the story is found. As an outsider, especially an American, I became intrinsically engaged in this book from its very first page. This culture, so alien and so secretive and so…. well… foreign, comes to life in the pages of A Chinese Life in a profoundly personal and visceral way. The reader lives through the history of China as it watches Li Kunwu’s life unfold. And it is turbulent, and it is chaotic, contradictory, and filled with conundrums. But there is something else going on as well. As much as “progress” is constantly referred to in this book, there is still a harkening back. As much as the government tried to break with the past, that past was and is still so much of what makes China, “China”. Li Kunwu’s story circles like a whirlpool, sucking everything in to a new depth, but, in its velocity, detritus of the past bobs to the surface giving us something to grab on to so as to moor us as we float in the narrative. And we need these dinghies to keep us above water because, as I said earlier, this story is enormous. Adding to the engagement is Li Kunwu’s art. Loose and expressive, evocative of Chinese calligraphy, Li Kunwu’s brushstrokes flow across the page adding serenity in some panels, turbulence in others, but there is always a sense of movement, progress, of “never going back”. 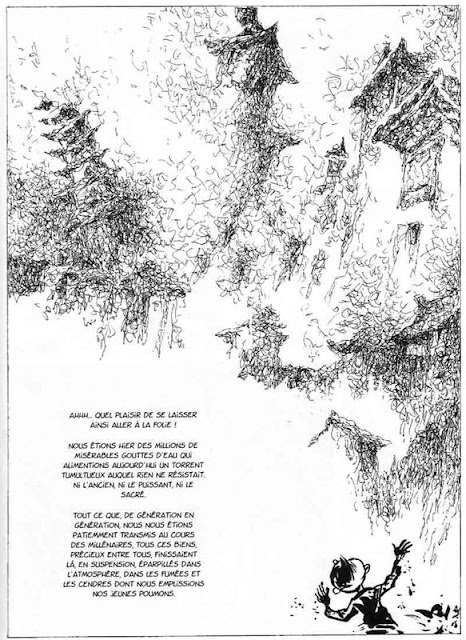 At times Li Kunwu leaves large swaths of the page a stark white indicating a vastness to the landscape that details would delineate too much. Other times there is a cacophony of lines, a confusion of shapes, a hubbub, a swirl of activity -- here the claustrophobia of the crush of the population is almost overwhelming, choking. Li Kunwu’s art engages all the senses with what he chooses to express as much as what he chooses not to show. 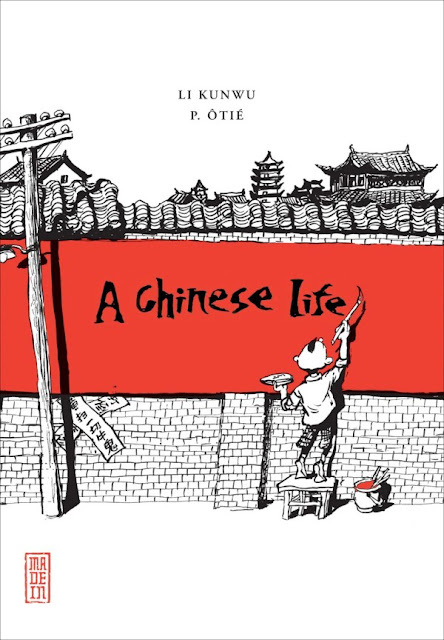 A Chinese Life is a graphic memoir that tells so much more than just the story of one man. As China continues to grow in influence on the world stage, it becomes more important for everyone to garner more than just a passing acquaintance with what makes it “China”. Li Kunwu has done us a great service in this regard by making the vast story of China easily navigated by making it the story of one man, and, by doing so, perhaps reminds us of our common humanity.